The average human eye can see objects approximately 0.1 mm in size. 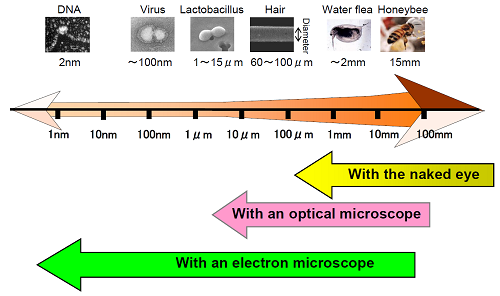 To observe objects smaller than 1 micrometer, an electron microscope is used. A Scanning Electron Microscope (SEM) uses a focused beam of high-energy electrons to generate a variety of signals at the surface of solid specimens. Theses signals reveal information about the sample including surface morphology (texture), chemical element composition, and crystalline structure as a result of electron-sample interactions. UW Bothell installed a Hitachi SU5000 SEM with an energy dispersive X-ray (EDX) microanalysis system for use in multidisciplinary research and education. This instrument was purchased with an National Science Foundation Major Research Instrument (NSF MRI) grant and specifically chosen to meet immediate and foreseeable future research needs in the School of STEM at UW Bothell. The microscope is capable of covering a broad range of imaging needs and EDX analysis which provides flexibility to maximize the number of researchers, and types of research, who can make use of the microscope. While the primary use of the SEM/EDX will be in support of research, it will also be integrated into research training and course curricula. SEM is an increasing common research tool, and hands-on training in this technology will better prepare UW Bothell graduates for successful STEM careers. The Hitachi SU5000 SEM will be used by a group of researchers, to both foster new research directions and facilitate multidisciplinary research collaboration at UW Bothell. At least five research groups currently plan to use the instrument in a diverse array of research and teaching portfolios. This system will allow exploring an efficient light trapping of organic solar cells, biocompatibility of electrochemical sensors, nanomorphology of various organic/inorganic materials. The SEM will substantially enhance the UW Bothell research infrastructure that will allow more diverse and high impact research program development and will facilitate research in a range of multidisciplinary fields including electrical engineering, mechanical engineering, chemistry, material science, and bioengineering, and microbiology. The Bothell campus of the University of Washington is a primarily undergraduate research institution that has only recently (since 2011) started offering degrees in the natural sciences and engineering (EE since 2010 and ME since 2014). The Hitachi SU5000 SEM/EDX system will transform education at UW Bothell by embedding research and research training within traditional lecture-based courses. More than 5 STEM courses are ready to utilize the proposed SEM/EDX in their courses, better preparing UW Bothell graduates for successful STEM careers. Because UW Bothell is the most diverse campus in the State of Washington (43% of the student body are students of color, 64% of the incoming first-year class is comprised of students from diverse backgrounds, and 48% of incoming first-year students are first-generation college students), the SEM will provide access to the state-of-the-art research equipment to a population of students who may not otherwise get this opportunity. The SEM/EDX will be a key instrument used for active student recruitment events targeting women and minorities, as well as K-12 outreach activities. UW Bothell will facilitate access from local companies and community colleges as well.